Most affordable New Business Law / Legal Environment Textbook? | Victor D. López, J.D., Esq. Most affordable New Business Law / Legal Environment Textbook? Since 1993 I’ve published five textbooks and textbook editions with Irwin/McGraw Hill, Prentice Hall and Textbook Media Press. One of the major considerations for me then and now was to provide an alternative to the high price of textbooks that placed them out of reach for too many students. I also needed an alternative to textbooks that were simply too long, overly complicated and featured too many pedagogical devices (sidebars, case studies, key terms, definitions, and many other “learning aids” that cluttered the main narrative and served to confuse students more than to enlighten them in my experience). I wanted to provide an alternative way: clear, concise chapters with interesting examples that students could both understand and relate to and I hoped also enjoy reading. And I wanted to have textbooks that would cost only a fraction of the competition. After all, what I need in a textbook as a professor is a book that students will read, understand, and that will provide a foundation for my lectures. I want the textbooks I select for my courses to provide not all possible information about a subject but accurate, clear information that can be easily absorbed and retained by my students and that I can build upon in my lectures by re-emphasizing key points and moving beyond them with examples drawn from current events, recent cases and emerging developments in the law that no textbook can ever provide. That has been my mission for the past quarter century and one that continues into the newest iteration of my newest textbook. Whether you are a student struggling to understand the concepts in the assigned book for your business law, legal environment or introduction to law class or a like-minded colleague who needs an inexpensive, readable textbook for classroom use, I hope you will take a few moments to learn about the third edition of my new textbook. You will not find a more affordable text from a traditional publisher, nor one that offers more format options in electronic and bound formats starting at just $29.95. Even if you are not interested in finding an alternative to your currently adopted textbook, I’d be grateful if you would consider forwarding or emailing this information or link to anyone who may find it of interest. Links and some additional information appear below. Thank you! 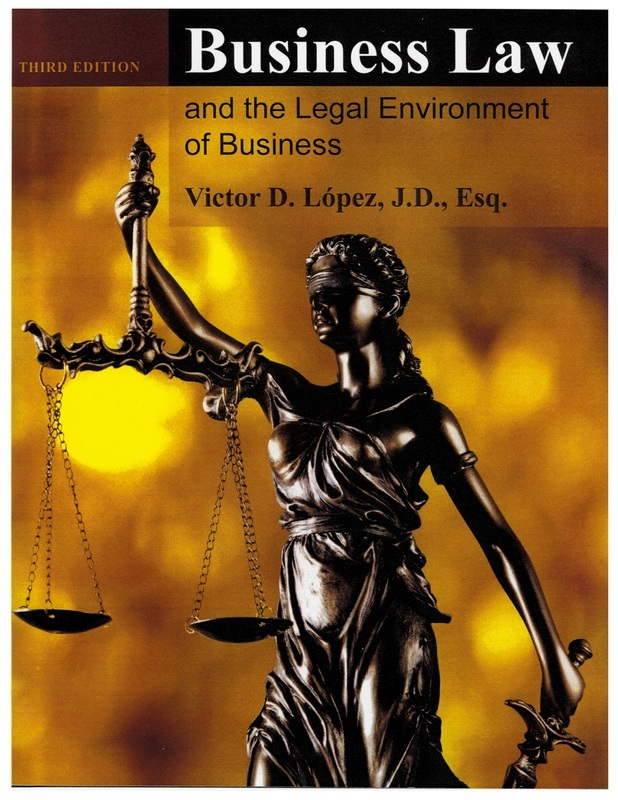 BUSINESS LAW AND THE LEGAL ENVIRONMENT OF BUSINESS THIRD EDITION. THIS EXPANDED AND THOROUGHLY UPDATED VERSION (2017 COPYRIGHT) FEATURES 45 CHAPTERS, INCLUDING A NEW CHAPTER ON CONSTITUTIONAL LAW, END OF CHAPTER QUESTIONS, SAMPLE CASES, AND ETHICS AND THE LAW EXERCISES FOR FURTHER STUDY AND DISCUSSION. THE TEXT INCLUDES A NEW FEATURE–TIMELY, END OF UNIT CASES SUITABLE FOR BRIEFING. THE TEXTBOOK IS AVAILABLE IN VARIOUS BOUND AND ELECTRONIC VERSIONS STARTING AT $29.95! TEST BANK AND INSTRUCTOR’S MANUAL ALSO WRITTEN BY THE AUTHOR. FOR MORE INFORMATION OR REVIEW COPIES, VISIT TEXTBOOK MEDIA PRESS. YOU CAN ACCESS THE BOOK’S WEB PAGE BY CLICKING HERE. ANY COLLEAGUES INTERESTED IN REVIEWING THE TEXT FOR POSSIBLE ADOPTION CAN DO SO BY CONTACTING MY PUBLISHER DIRECTLY HERE. THE SECOND EDITION OF THIS BOOK HAS BEEN ADOPTED BY A WIDE RANGE OF COLLEGES AND UNIVERSITIES RANGING FROM TECHNICAL AND COMMUNITY COLLEGES THROUGH AACSB-ACCREDITED SCHOOLS OF BUSINESS. THE SIGNIFICANTLY EXPANDED THIRD EDITION (2017 COPYRIGHT) SHOULD BE EVEN MORE ATTRACTIVE TO CURRENT ADOPTERS, ADOPTERS OF MY PREVIOUS FIVE TEXTBOOKS, AND I HOPE TO NEW ADOPTERS AS WELL. MY STUDENT-CENTERED APPROACH TO THE SUBJECT IS VERY DIFFERENT FROM WHAT YOU WILL FIND IN ITS TRADITIONAL COMPETITORS. IT IS ACCESSIBLE BOTH IN ITS PRICE AND CONTENT. PLEASE GIVE IT A LOOK.